My first travel to Vienna is not intentional. I’d rather go to the Philippines because lately the only time I can see my mother is when I visit the Philippines. Yet somehow things turned up differently than how we like it to be. Our eldest brother who live at Vienna cannot go home to the Philippines. He was into a health regimen necessitating his presence in the hospital 3x a week. Stopping or altering the medical regimen will mean toying with death. We came to the point were my sister from Tokyo and my brother who live at Oregon and me from Florida went to Vienna to see and bond with our eldest brother. 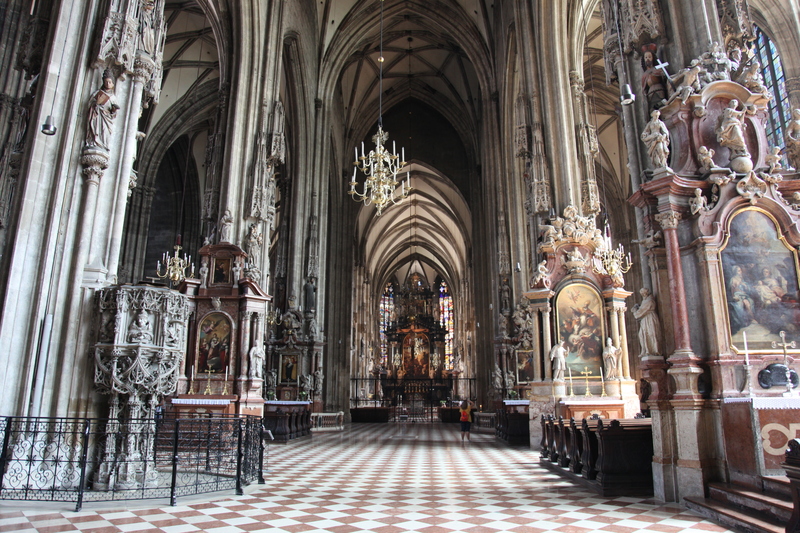 It was not really my intention to tour while visiting Vienna. Seeing our eldest brother and my other siblings was the main reason I went. The rest was a bonus or I’d rather say blessings. 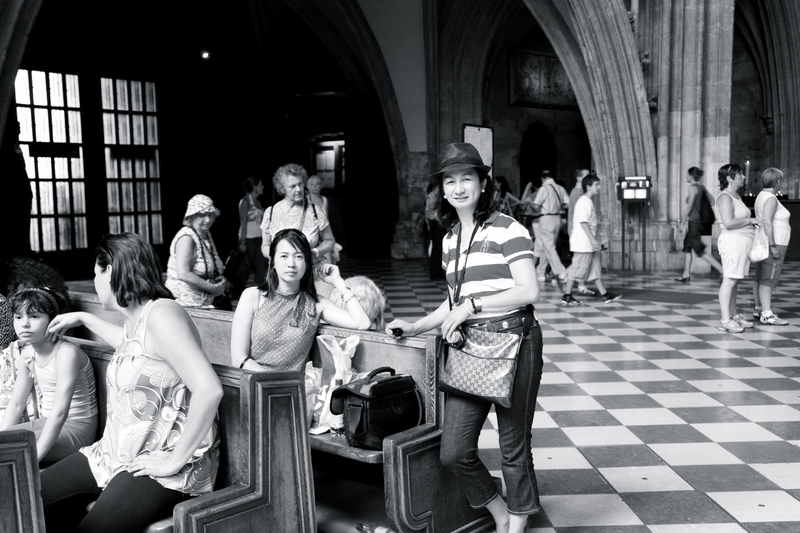 Thanks that my elder sister who toured many places in the world was eager to explore even though that’s her third time to be in that city. So off we go. 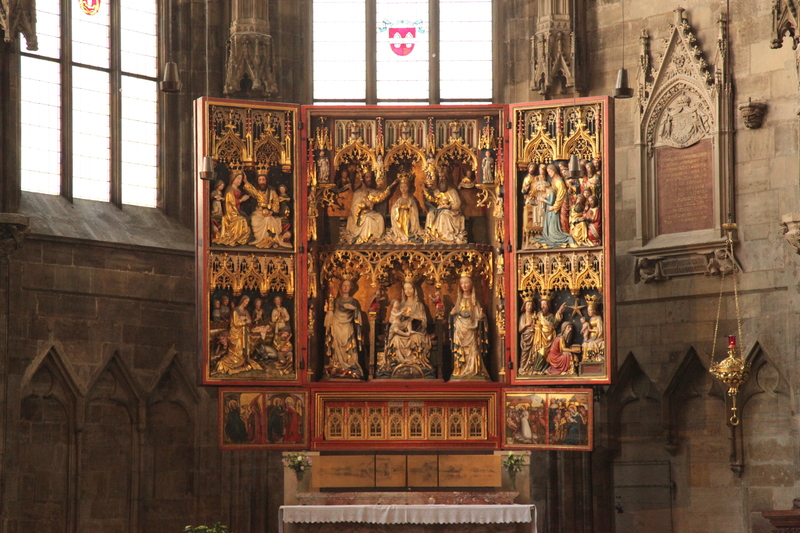 In this blog I’ll only discuss and show some pictures of the Stephansdom cathedral. It really look like my visit to Vienna was incidental but in God’s timetable, it is time for me to see the historic place that I first saw only at the movie, the one titled “The Sound of Music (film).” Advance reading of the city’s history could have been helpful for me, instead I had an impromptu learning. The city is not very big but home to many historic palaces, castles and of notable people of history like Mozart, Elisabeth of Austria , Maximilian II etc. On the night of my arrival me and my siblings together with our sister-in-law went to see the Stepansdom cathedral also known as Stephansplatz. 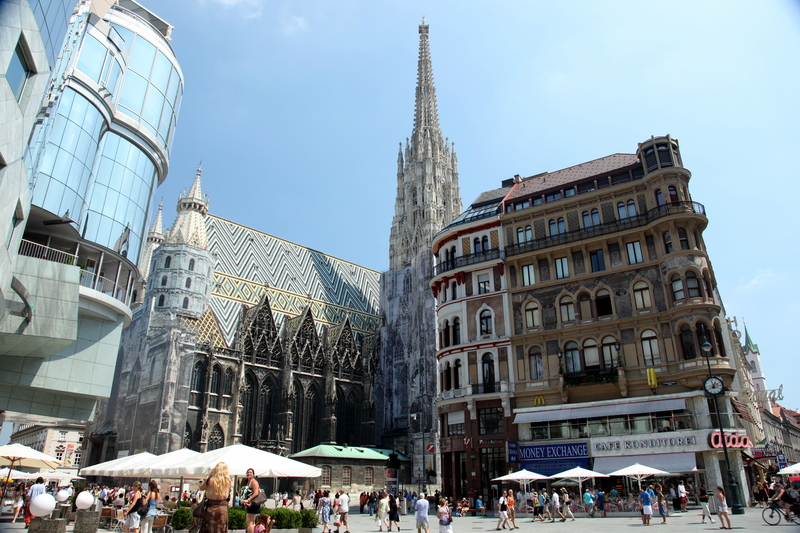 The Stephansplatz is a square at the geographical centre of Vienna. 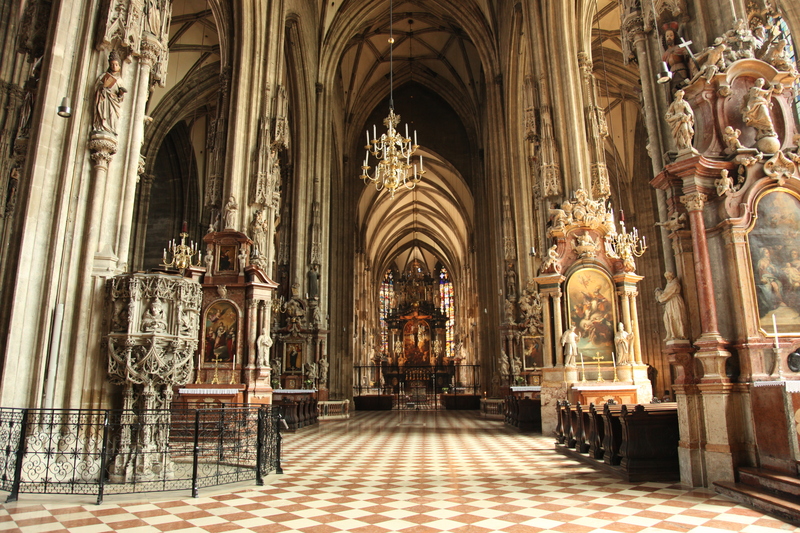 It is named after its most prominent building, the Stephansdom, Vienna’s cathedral and one of the tallest churches in the world 1. The cathedral was being renovated then. After resting overnight the following day we went to the cathedral again and took some pictures of the interior, some of the pictures below are taken by my brother and sister but since I’m the only one that brought a laptop they uploaded the pictures from their cameras to my laptop and I’ll show some of them here. 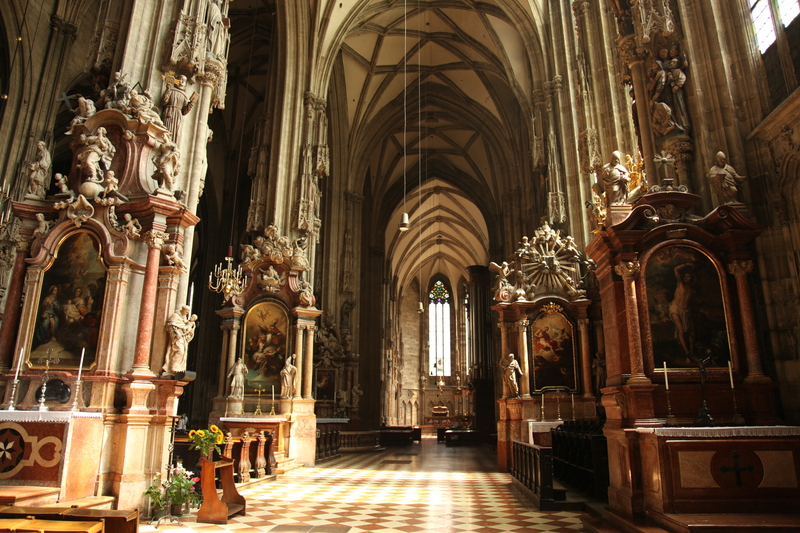 I’m not really sure if the Austrian still conduct mass there because now it is more of a tourist attraction. The interior are fenced and there’s only a small area of the place where the onlookers can just see and admire the magnificent structure. Anyone can buy a candle outside, lit the candles and place them in a designated place for candles. It is not my obsession to know details of these people’s history but I learned that Eugene of Savoy is a general and the one who erected the palace at Belvedere. 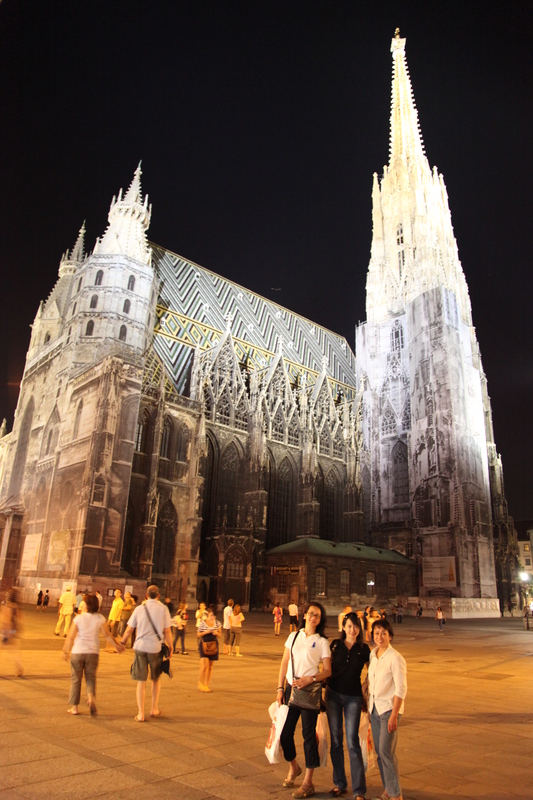 On that day I was just thankful to God that I was given the prospect to see part of Vienna with my siblings. The girl from a small town in the province of Laguna Philippines. 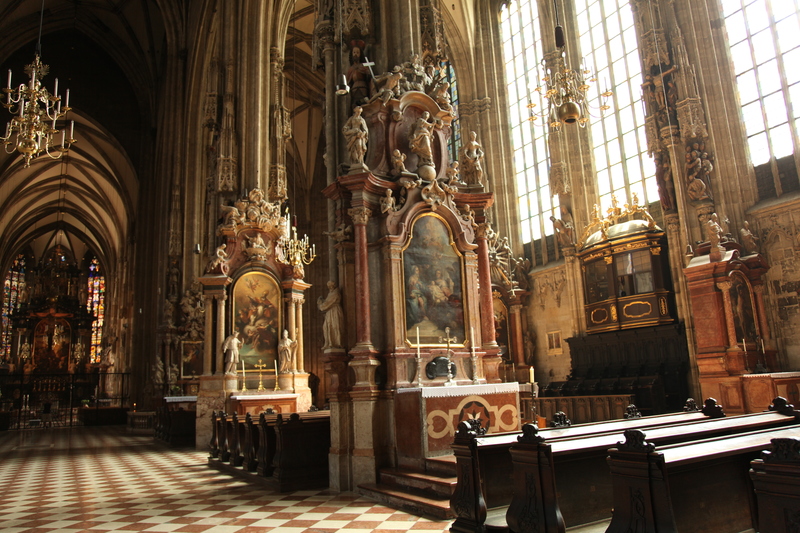 This entry was posted in vienna and tagged Stephansdom, Stephansplatz Wien. Bookmark the permalink. It’s my dream to see such a structure like this. Thanks for somehow giving ease to my yearning! It’s my dream to see structures like this very cathedral. Thanks for somehow giving ease to my yearning! One of the things I liked about you is your knowledge about the Bible. About God. I could see that radiating through your post especially The Clearing. The feeling is mutual as far as our traveling stories are concerned. You made me reach the places I can’t reach. I think I just like to give God glory for all the things in my life, I’m human, not perfect, sinner and forgiven just like others so I guess I’m trying to be reverent in my manner of conversation as it is written at 1 Corinthians 10:31 (KJV) “Whether therefore ye eat, or drink, or whatsoever ye do, do all to the glory of God”. Thanks and I hope you do not mind if I am at ease to call you Sony instead of sir that you greatly deserve. When you are my age, the bloggers could be your son, daughter or friends. Hope that explain why. Hello Kabayan(from Laguna din ako)! Di ko malilimutan ang ganda ng Vienna. Nakapunta ako noong 1991 at tunay na nalibot ang Vienna sa loob ng anim na linggo ng stay. Sa Stephansplatz ay magandang lugar lalo na kung weekend dahil maraming performers sa mga kalye. Madalas din na makasimba kami duon sa Cathedral dahil maraming Pinoy na dyan nagkikita-kita. Ganda ng pics…napa-reminisced ako talaga. Salamat sa pag-share. Glad to meet a kababayan from same province, who grew up at the foot of Mt. Banahaw, a mountain I dreamt of climbing someday yet did not materialized. It must have been fun growing near that mountain. Vienna truly has it’s charm but I dread to be in their mountain on winter time. From being oriental pasalamat na ako at sa Florida napadpad where the weather has similarities sa Pinas. Maganda nga sa First district where Stephanplatz is, lots of Cafes and people walking and touring. My late brother used to say, who on earth would have thought we will meet and bond in that historic place. Thanks for reading my post. Maraming salamat din. Doon kami sa bayan na sikat sa mga pagawaan ng mga tsinelas at dinadayo ng mga taga ibang bayan. Noong kabataan namin ay inaakyat namin ang Mt. Banahaw. Oo noong nagpunta kami sa Vienna ay summer pero malamig na rin lalo na dun sa matataas na lugar. Love ko ang place na Vienna at maybe someday ay makabalik doon. Minsan na rin ako nakapunta sa Florida sa malapit sa Orlando at tunay na pang Pinoy ang klima. Salamat at nice meeting din sa iyo. God Bless! You’re blogging now! I have not visited in a bit. Glad to see you’re posting. Vienna is lovely. Quite historic. You must have visited when it’s warmer.